Scientific research confirms that taking Omega-3 fish oil is good for your health because Omega-3s support healthy cholesterol, triglyceride, and blood pressure levels already in the normal range. Omega-3s also support the body's normal inflammatory response and promote optimal blood vessel, brain, and joint health. 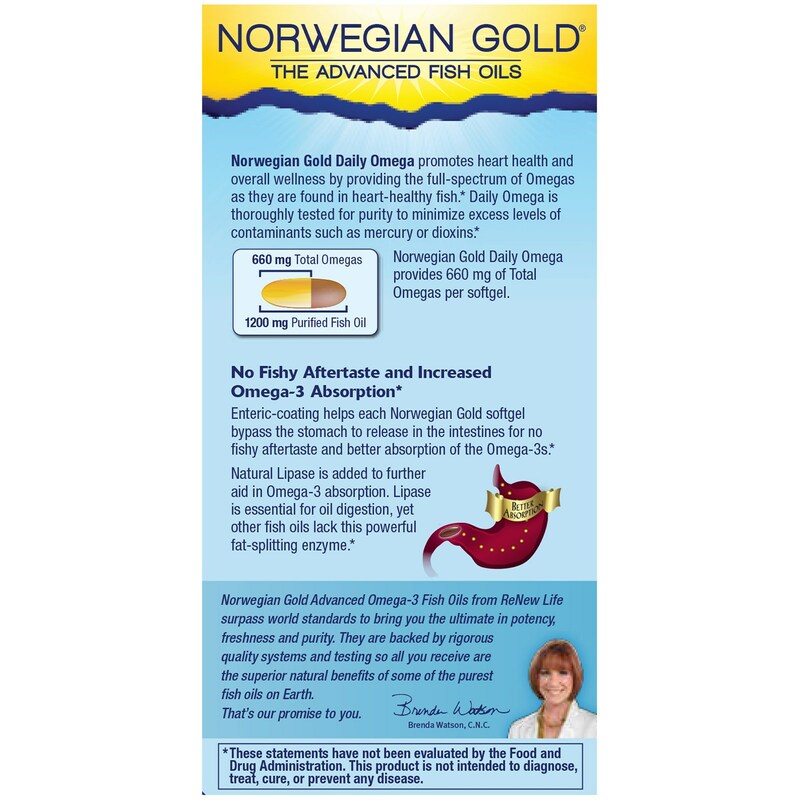 Enteric coating helps each Norwegian Gold softgel bypass the stomach to release in the intestines for no fishy aftertaste and better absorption of the Omega-3s. 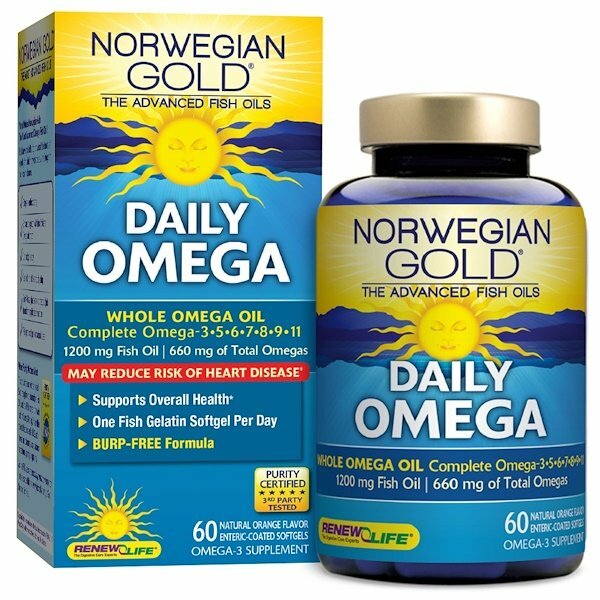 Each Norwegian Gold softgel provides all the benefits of expertly formulated, highly absorbed Omega-3 fish oils and so much more. This product has received the highest 5-star rating from the International Fish Oil Standards (IFOS) program, the world leader in Omega-3 testing. This certifies that each batch exceeds all U.S. and international pharmaceutical standards for freshness, purity, and potency. ‡Supportive but not conclusive research shows that consumption of EPA & DHA Omega-3 fatty acids may reduce the risk of coronary heart disease. For best results take 1 softgel daily, with or without food, or as directed by your healthcare professional. 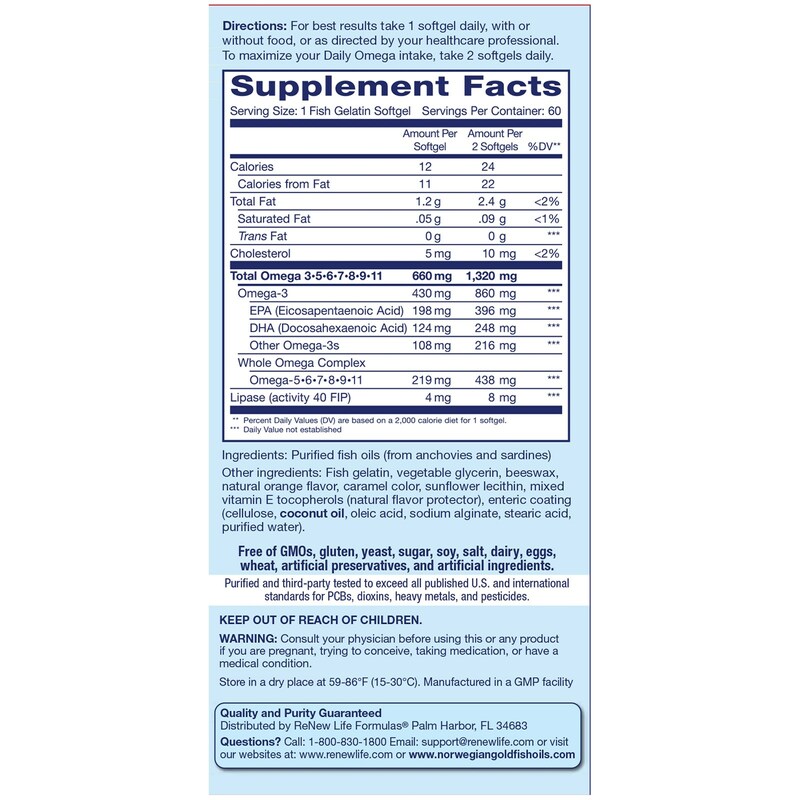 To maximize your Daily Omega intake, take 2 softgels daily. Purified fish oils (from anchovies and sardines). Consult your healthcare professional before using this or any product if you are trying to conceive, taking medication, or have medical condition.